U.S. Energy Storage Market size was valued over USD 400 million in 2017 and is set to exceed an annual deployment of 3,000 MW by 2024. 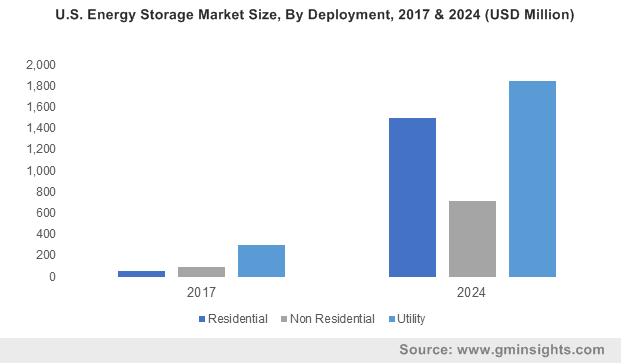 The U.S. energy storage market size is set to witness an appreciable growth on account of increased deployment of renewable integration along with rising investments aimed at building a reliable and smart grid infrastructure. Growing need for grid resiliency to support increasingly electrified networks including transportation, HVAC, manufacturing, and data will further drive the industry growth. Declining costs of components, most notably the continued price reduction of lithium ion batteries will stimulate the U.S. energy storage market size. The costs/kWh of lithium based batteries have nearly halved in the recent years from industry benchmarks and will continue to follow the price downturn. In addition, increasing manufacturing capacity coupled with a multitude of legislative and marketplace reforms will complement the industry landscape. Shifting trends toward clean energy transition favored by significant cost declines in solar and wind generation will boost the U.S. energy storage market growth. Strengthening focus on research & development driven by sizeable government funding will further favor the business scenario. The funding from the American Recovery and Reinvestment Act (ARRA) has enabled considerable addition of new energy storage to the U.S. grid. The U.S. residential energy storage market is set to witness exponential growth on account of supportive legislative framework aimed at maximizing renewable energy integration. The industry growth majorly led by California and Hawaii, is largely attributed to favorable state policies including renewable energy mandates and Self-Generation Incentive Programs (SGIP). Evolving net-metering legislations and growing customer interest in backup and solar self-consumption will further impart an impetus to the business expansion. The U.S. utility energy storage market is set to surpass USD 1.5 Billion by 2024. Escalating demand to build a more efficient and sustainable electric infrastructure supported by regulatory reforms will facilitate the expansive deployment of energy storage solutions. The Federal Energy Regulatory Commission (FERC), in February 2018, announced Order No. 841 which is aimed at enhancing competition and promoting the enhanced efficiency of the country’s electric wholesale markets while supporting the resilience of the bulk power system. Lithium ion, in 2017 accounted for over 90% of the U.S. energy storage market share in terms of annual deployed capacity. The industry growth is largely attributed to the dramatic reduction in the battery costs on account of improving economies of scale. In addition, the competitive ability of lithium-based chemistries to offer high storage capacity, improved charging rates, light weight, and relatively long service life will continue to encourage their deployment in the industry. Sodium chemistry-based energy storage market size is set to witness robust growth on account of escalating R&D activities to support renewable energy generation. Growing prominence of NaS batteries as a means to stabilize renewable energy output and facilitating ancillary services will accelerate the technology adoption. Lead acid batteries have been commercially applied for grid energy storage on account of significant advancement in their power handling performance and longevity competitive with other battery chemistries. 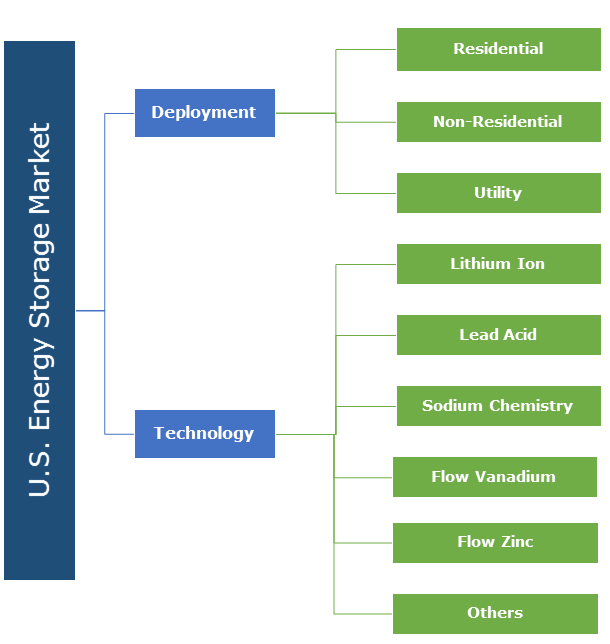 Notable industry players operating in the U.S. energy storage market include Duke Energy, E.ON, East Penn Manufacturing, EDF Renewable Energy, Fluence Energy, GE Power, Invenergy, LG Chem, Tesla, ABB, Johnson Controls, SolarEdge and EnerVault amongst others. Key industry players are actively entailing mergers and acquisitions, technological innovations and enhancement in their manufacturing capacities as strategic assets to gain competitive position in the business. In January 2018, AES and Siemens AG merged to form Fluence Energy, an energy storage company. Electrical Energy Storage (ES) refers to the conversion process of electrical energy into stored form which can be reconverted into electrical energy when required. The ability of ES to modulate demand and act as flexible generation when needed is the key feature that will boost the technology deployment. The technology is gaining increasing utilization across generation, transmission and distribution systems of the electric power system.